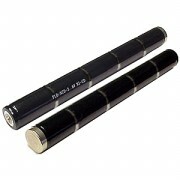 FLB-NCD-3 is a 6.0 volt 1600mAh Rechargeable Ni-Cd Battery Stick for flashlights. Replaces / Fits the following models: Streamlight SL20XP, Streamlight SL15X, Streamlight 405462100, Streamlight 40070131, Streamlight 25170, Streamlight 201701, Streamlight 15X1701, GE 40070131, GE 405462100, etc. NOTE: Picture shows front & back of stick for visual reference. Pricing is for ONE battery stick.